Sister Jean Dolores Moratti, I.H.M. 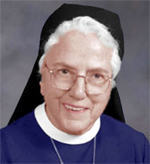 Sister Jean Dolores Moratti, I.H.M., died Dec. 20 in Camilla Hall, Immaculata, in her 78th year of religious life. She was 96. Born in Mahanoy City, Pa., Sister Jean entered the Congregation of the Sisters, Servants of the Immaculate Heart of Mary in 1936 from St. Ann Parish in Lansford, Pa., and professed her vows in 1939. She taught in the Archdiocese of Philadelphia and the Diocese of Arlington, and served her religious community as a regional superior and as superior of Camilla Hall. After a few years of service at Villa Maria House of Studies she was assigned to Camilla Hall in 2002. The funeral Mass was celebrated at Camilla Hall on Dec. 23 by Father William E. Dean, who was also the homilist. Concelebrants were Msgr. Joseph Logrip and Norbertine Father Joseph P. McLaughlin. Sister Jean is survived by members of her religious community and her devoted cousins. She was predeceased by her parents John and Rachel Valentine Moratti; her sister Ada Moratti and her brother Joseph Moratti.